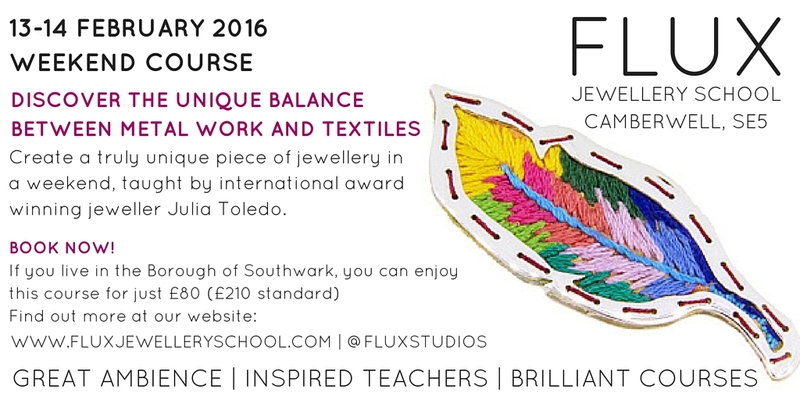 Behind the doors of Flux Jewellery School there is a wealth of talent working on exquisite pieces and winning awards…but who are they? Julia Toledo is an artist, designer and maker with a Masters Degree in Jewellery, Silversmithing and Related Products from Birmingham School of Jewellery (BIAD) Institute of Art and Design. Born and raised in Brazil, Julia keeps her cultural background always present in her creations and values. Bold colours and natural textures are seen in a variety of nuances in her work. Her main interest rests on studying ethnical crafts such as embroidery, weaving and basketry, absorbing values, contents and meanings that go deeper than the stunning visual impressions. Applying these values to her work and designing unique jewellery that inspires, it is no wonder she is the winner of many international awards, most recently 2015: Artistar Jewels – Best Goldsmith. If you love the softness of silk, delicacy of lace, intensity of leather or the natural look of cotton, and want to incorporate these qualities into your designs to create fabric and metal jewellery, why not book onto the Feburary 2-day weekend course (13-14 Feb 2016). Julia will be guiding you through the process of contrasting elements together using a variety of joining methods including cold connections like riveting, screw threading and weaving. Tagged Classes, Courses, Flux Studios, Julia Toledo, Southwark, Southwark Adult Learning, texture, Vanguard Court, weekend, Workshops. Bookmark the permalink.